Virtual desktop infrastructure (VDI) implementations such as the VMware Horizon View helps enterprises combat rising data center costs and management headaches. However, many VDI implementations never reach production level due to costly downtime issues, poor performance and end-user complaints. 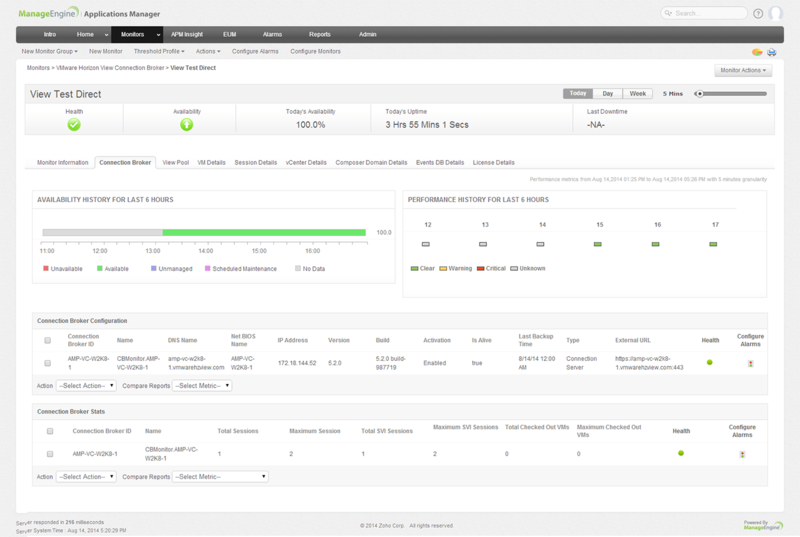 Applications Manager enables comprehensive performance monitoring of the entire VMware Horizon View service to ensure a healthy VDI environment. It helps you drill down into the Horizon View implementation and its underlying components, including the View connection broker, hypervisor, VMs, applications, active directory, database, servers and storage hardware. It enables you to minimize downtime, quickly identify performance issues and take corrective action before the end users are affected. 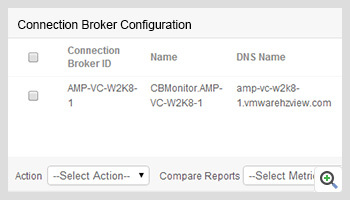 Ensure availability of the connection broker and monitor broker statistics. 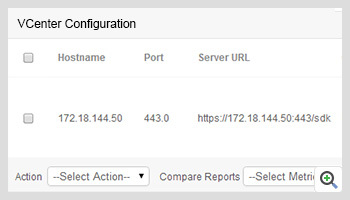 Access information about the performance of Horizon View clients connected to Horizon View desktops. 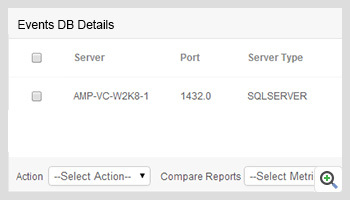 Monitor connection server role performance data like SVI Sessions details and checked out VMs. 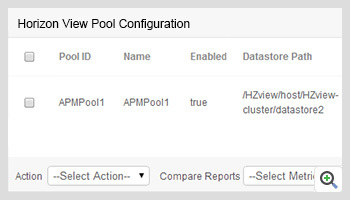 Get data about the status of desktop virtual machines and datastores used by Horizon View pools. Understand desktop provisioning for a pool; track the minimum and maximum number of desktops that should be provisioned for a pool. Identify virtual machines with high workload or datastore capacity in the pool and troubleshoot virtual machines that indicate poor performance. 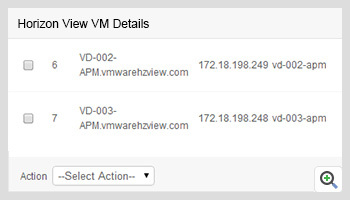 Identify if a virtual machine is in the View Pool, the pool details and if the VM is a linked clone desktop. Quickly see resources related to local and remote end user sessions and concurrent session count. Access information about session protocols, the state of the desktops and durations of sessions. 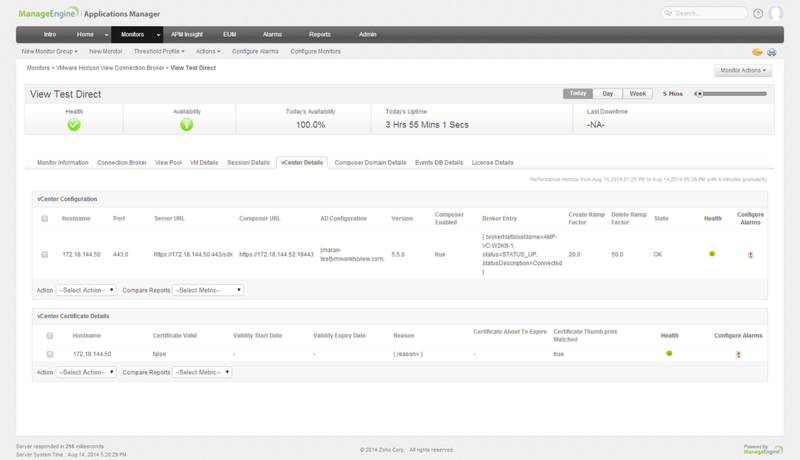 Monitor the configuration of vCenter servers in Horizon View and vCenter certificate details. Find out if a View Connection Server instance can connect to the configured vCenter servers. Get information about your Composer domains and check Composer status. Determine if the event database is configured and if events are being recorded to the database. Get notified if the event database is not connected. 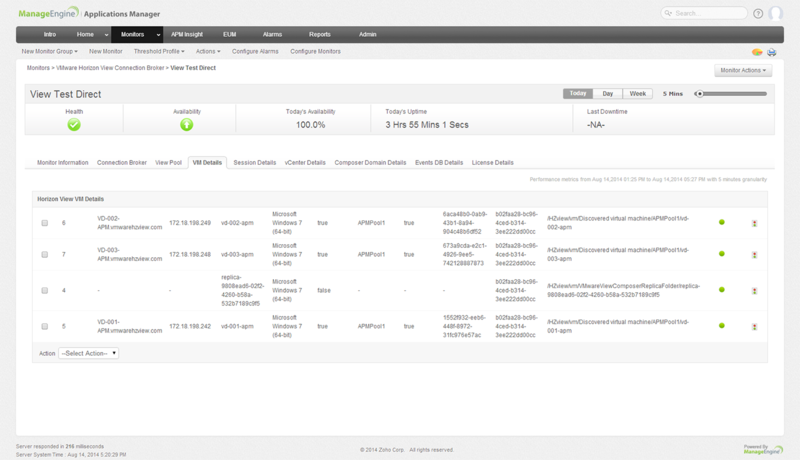 Manage installed View Licenses and Local Mode of your View Client. 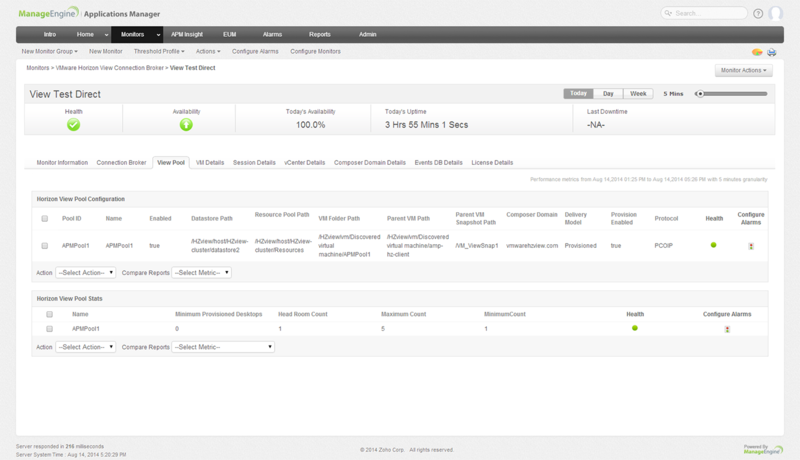 With Applications Manager reports, you can proactively identify performance issues and initiate remedial actions quickly to ensure a great user experience within your virtualized data center. 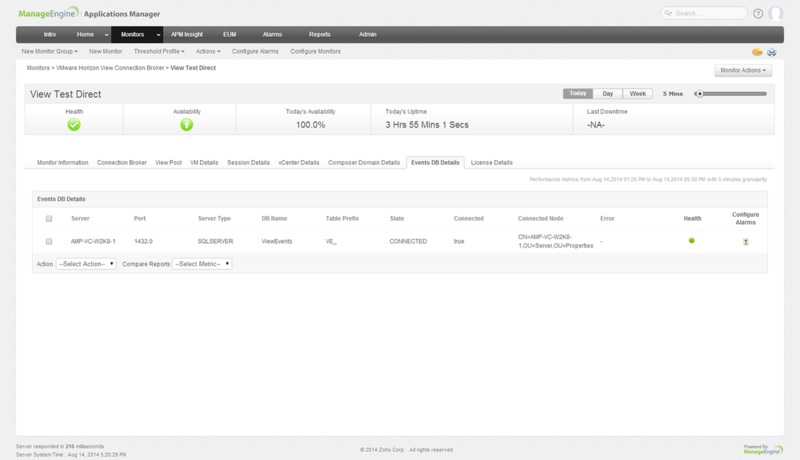 Configure alarms and get notifications of performance problems and downtimes via email and SMS instantly. Effectively plan capacity to optimize virtual desktop performance and guarantee maximum ROI. Applications Manager also supports monitoring of vCenter Servers, Active Directory, MsSQL or Oracle DB used for Events and Query Monitor with events query.